Side bow chains, also commonly known as a side flexing chain is manufactured for specialty applications that require a high-strength ANSI standard roller chain that has the capabilities of going around turns and side flexes. This is why side bow roller chains are also commonly known as side flex roller chain. We keep these chains stock in ANSI sizes #35 - #80 in standard carbon steel as well as 304-grade stainless steel. We also stock base chains for slat-top conveyor chains in sizes #43, #63, #63SS, and #863. For more information or to get a quote on side bow roller chain please contact our sales team and we will be happy to assist you. 80SB 1.000" 0.625" 0.621" 0.676" 0.731" 0.950" 0.125" 0312"
80SS-SB 1.000" 0.625" 0.621" 0.676" 0.731" 0.950" 0.125" 0312"
Note: Part numbers ending in SS are stainless steel material. What is Side Bow Roller Chain? Side bow/ side-flexing roller chain is a chain that is manufactured with a slightly longer pin length than a standard chain. What this does is allows for a larger space between plates, thus producing a chain that can side-flex. There are two different styles of this chain. The first and most common style (represented in the sketch above) is your typical ANSI 35 - 80 side bow chain and can run on standard roller chain sprockets. 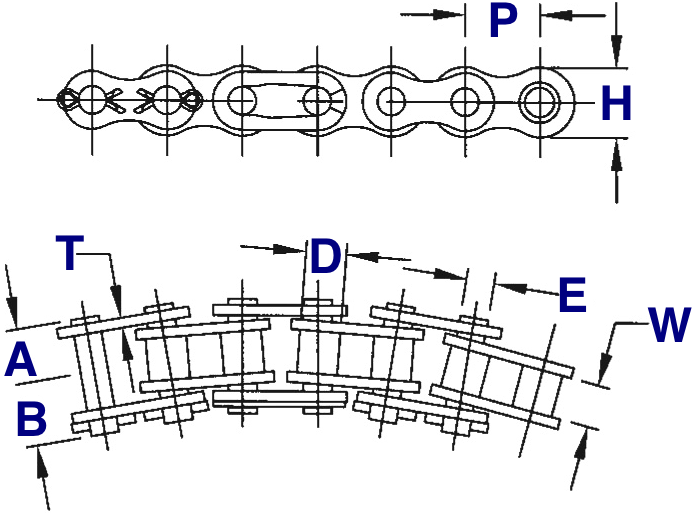 The other style (represented in the sketch above) is used for table-top chains and is commonly known as a "base chain" (example in the photo below) this style will run on standard sprockets, but if it is being used as a base chain special sprockets with a flattened tooth profile will be required. Common sizes for this chain are 43, 63, and 863.